Hoot! Hoot! Isn’t this owl the cutest? Especially with that cute little trick or treat bag! And look at those masked eyes filled with mischievous rhinestones – he is definitely ready for a night out on the town full of Halloween fun. This little guy is from the hostess set “Warmest of Wishes” featured in the upcoming Holiday Mini Catalog which can be purchased with FREE hostess dollars earned at a holiday party or workshop. The background paper featured on this card is from the new Designer Series Paper pack called “Pick Your Poison” which coordinates with the new stamp set “Piece of Poison”. 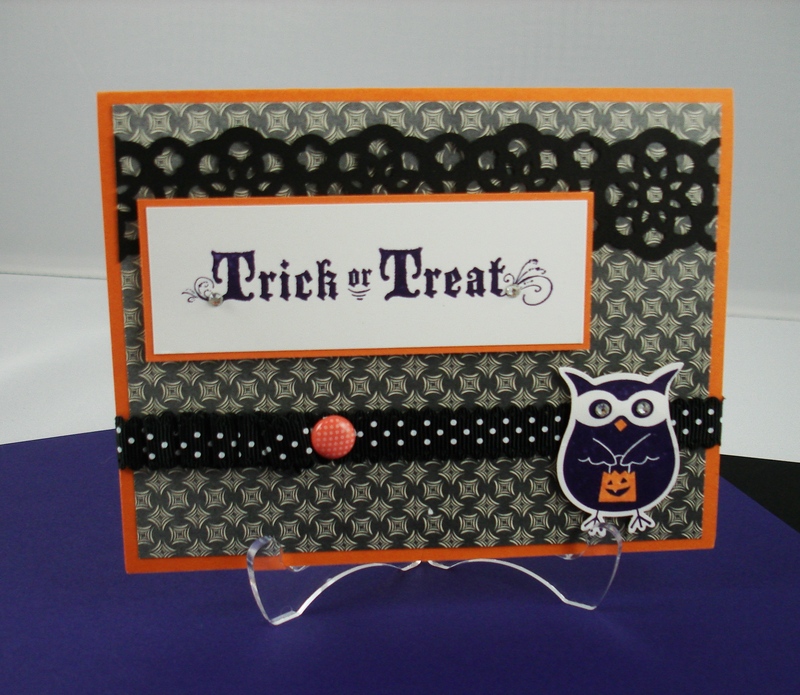 I got my “Trick or Treat” saying from this set which includes some other really creepy stamps great for making all of your Halloween creations. That beautiful black border at the top of the card was made using the new Lace Ribbon Border Punch and the finishing touch was the new Basic Black Scallop Dots Ribbon which I ruffled a bit before placing the Designer Printed Brad in Calypso Coral. I like my new owl friend, I think I will call him Hootie!